Short-termism ~ "Smell what sells"
In the recent episode of The Apprentice, the two remaining teams of three were given £250-worth of wholesale goods and told by Lord Sugar that they would need to identify their best selling products and reinvest in those items to sell and increase their profit margins. "Smell what sells" was the phrase he used. "We didn't offer a deal to Richard Pacquette ... He closed the door on negotiations at an early stage saying he wanted to be at a full-time club, and that's the end of it as far as we’re concerned"
Boss Johnson Hippolyte says any sort of deal is a long way off for the talented striker, but did not completely rule out bringing him to York Road for a second time. He did admit, however, that it would only come about if one of the Football League clubs who are interested in Alex Wall agree to sign the young United forward. "I'm not saying that we're going to sign him, but if Alex was to go and we got a transfer fee then we might be able to get someone like Richard"
Officially Maidenhead United's record fee received remains the £5,000 Norwich City paid for Alan Cordice in 1979. I suspect that this was actually surpassed, by the 'undisclosed' amount paid by Havant & Waterlooville for Mustafa Tiryaki, some thirty years later. The similarities between Tiryaki and Wall are notable: raw, hot-headed young strikers plucked from obscurity (semi-professional Turkish football, in Tiryaki's case, Wall from Thatcham Town Youth) who, to various degrees, terrorised vastly more experienced Blue Square South defenders with their hard work, relentless running and physical play. Wall is, IMO, Tiryaki-lite but it is no surprise to me that he could follow the Turk in becoming one of the few Maidenhead United players that someone has paid a fee for. If so, why on earth would you consider spending any cash windfall on someone like Pacquette who, if not able to find a full-time club, will presumably still be looking for someone to pay him as close to a full-time wage as possible? The problem with quoting Alan Sugar in a football blog is that Hackney's finest was hardly a resounding success when in charge of Tottenham Hotspur. A prime example, one could say, of a successful businessman who floundered in charge of a football club. A businessman who hasn't floundered in charge of a football club, however, is Dave Whelan at Wigan Athletic (the caveat to this is that Whelan was a professional player, of course, before entering the world of retail). Now, I'm not Wigan's biggest fan - I'm fed up of seeing rows and rows of empty seats on TV, when they play at home, and view them as a noddy, no-hope club with little history or fan-base who are only where they are thanks to the millions pumped in by their Sugar Daddy owner (sound familiar??) - but, fair play to Whelan, he went about things the right way, IMO; building the JJB Stadium as early as 1999 (the Latics weren't promoted from Division Two until 2002/03, having won the Division Three title in 1997/98). He realised that the infrastructure - the stadium - had to come first, before the promotions. Is Peter Griffin - MUFC Ltd Chairman, benefactor and successful businessman - more Sugar or Whelan? His "I would rather spend money on players ... than on the ground" response - to a suggestion from MUSA, in the summer of 2009, that a fixed percentage of the budget be set aside for ground improvement - does, I think, provide an answer. The summer of 2009 also saw Pacquette depart the club after sweeping the end-of-season awards. The 2008/09 season had been one of Dale Binns, Ben Surey and Ashley Nicholls as summer signings. A 'superstar' strike force of Pacquette, Rocky Baptiste, Manny Williams and Lee Newman (with Tiryaki out on loan at Potter's Bar and Godalming!). A playing budget that was far from streamlined. No one seemed to care, though, as we flew high in the table (losing a top-of-table clash with Chelmsford City, at York Road in November, in front of a 782 crowd). Club Director Mark Steward imposed on a MUSA meeting ,early in the season, to ask that supporters urgently sponsor new seats as York Road didn't have the required amount for play-off participation/promotion. It still doesn't. Then, around February, the recession hit and the budget was slashed. Binns - who we had been told had signed for reasons other than money (haha!) - was the first to bolt (for HAYU). 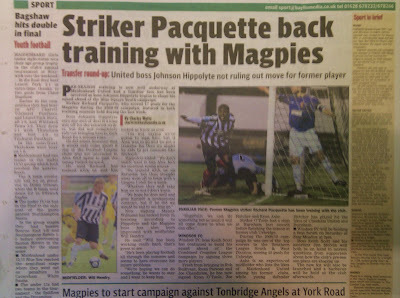 Pacquette was sent out on loan to Histon. Baptiste left quietly (not before time!). Youngsters such as the promising Gavin James (who would horrifically break his leg, in two places, at Dorchester Town in March), the not-so-promising James Hamsher (where is he now? ), Aryan Tajbakhsh and Tiryaki were given chances to impress. The latter hit a purple patch of six goals in six games (forming a devastating partnership with the returning Pacquette) and a late season rally saw us finish 6th - six points and one place from the play-offs (that we couldn't have competed in anyway) - our highest position ever yada, yada, yada. As MUSA set up a ring-fenced ground improvement fund, MUFC Ltd vowed to operate thereafter within a strict playing budget. Drax moaned (still does) - as is a manager's prerogative - but the following season was, IMO, our most enjoyable and satisfying in the Conference South; a predominantly young, inexperienced, cheap (no player was, apparently on more than £250 per week) and seemingly tight-knit squad - lead and epitomised by captain Mark Nisbet - recovering from an inauspicious start to finish comfortably clear of the relegation places. Yet York Road still doesn't have the required seats for us to compete in the play-offs, even if we were to reach them! We're playing at one of the most decrepit, ill-equipped grounds in the division in front of one of the lowest average attendances ... but are apparently considering spending any potential transfer fee we get for a young striker on the wages of a 28-year-old who is looking, ideally, for a full-time contract and has played for nearly twenty clubs in his career?? There has been much talk that Peter Griffin will, if we are ever in the play-off hunt again when entering the New Year, pay for the new seats to be hurriedly shoe-horned in (probably onto the Bell End terracing). That would be typically-Maidenhead United; a short-term, make do, botch job. Drax would naturally love to have another promotion on his CV. 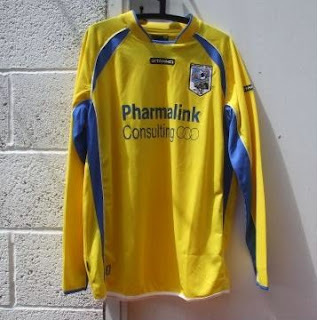 Peter Griffin would presumably love to be able to tell his business associates that he is the Chairman of a Blue Square Premier side (and the national exposure would be great for our shirt sponsors; Pharmalink Consulting). Those in MUFC Ltd blazers would no doubt love to munch on the better quality of biscuit offered in the boardrooms of Luton Town, Cambridge United and Stockport County. Heck, supporters such as I would certainly love (initially at least) away days to the likes of Gateshead, Lincoln and York. But, being altruistic for a moment, would promotion really be in the best, long-term, interests of the club? How do St Albans City fans, for example, look back now - with the benefit of hindsight - on their season in the sun? As things stand, we are playing in a division that we can't get promoted out of and would, in all likelihood, have to finish rock bottom of to get relegated from. As such, our squad should be more 2009/10 (£250 per week players with everything to prove) than 2008/09 (£500+ per week players with nothing to prove). Any transfer fee for Wall should be reinvested in another young, hungry, up-and-coming striker who will hopefully thrive and also be sold ("smell what sells"). Money saved on the likes of Pacquette should, IMO, be spent on improving - rather than merely maintaining - the ground and encouraging youngsters to the games (as we have done previously, with discounted entry). Fat chance, it would seem. When Michael Thomas scored that goal at Anfield in May 1989, he was wearing a yellow Arsenal away shirt (I was delighted to receive the full kit, including shorts and socks, the following Christmas). In an early (if not the very first) Maidenhead United FC constitution, it was agreed that the club colours were to be black and white, with red. It is my opinion, therefore, that Arsenal's away kit should always be predominantly yellow, while Maidenhead United should play in black and white (with red socks), and have red as a change colour. After initial exclamations, such as "What the actual f@ck?? ", the obvious question that presented itself was "Why?" I suspect, in Arsenal's (or, perhaps more pertinently, Nike's) case, it has everything to do with money; an attempt to sell more units. I cannot believe that another yellow Arsenal away shirt - even one with a rather cheeky, only-very-slightly-tweaked design - would prove any less commercially viable than a W@nky Wanderers-esque jockey silk, however. As for MUFC Ltd, I suspect this is change for changes sake; a 'because we can' type-of-decision. 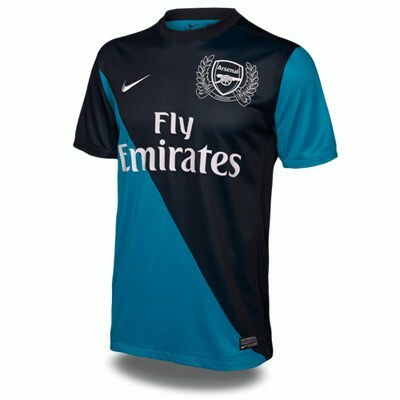 FWIW, I think that both the disregard of tradition, and the kits themselves, are disgusting. UPDATE, 05/07/11: Just when I thought that it couldn't get any worse ... 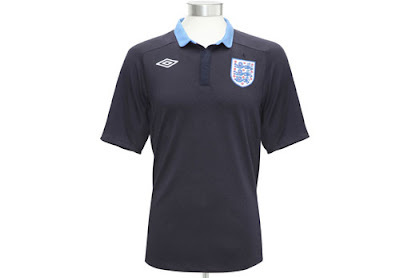 I now learn that the t-shirts the rather laughable David Haye and his encourage were wearing, immediately prior to Haye's capitulation to Wladimir Klitschko in Hamburg last Saturday, weren't replica England training tops but the new away shirt (below). Memo to Umbro: Bobby Moore and the other heroes of 1966 wore red!